Ocean beach Ibiza, one of the most luxurious venues of the island, encapsulates the ultimate beach club dedicated to creating a unique and luxurious lifestyle experience for those looking for that ideal daytime destination to relax and party under the Mediterranean sun. 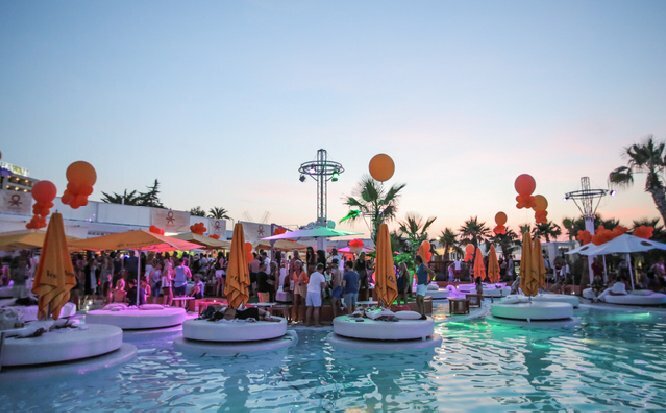 Situated on the West Coast of Ibiza in San Antonio, Ocean Beach is located on the S'Arenal beach front with beautiful ocean views by day and the stunning Ibiza sunset at dusk. Designed so you can plan your day exactly the way you want to, the 600m2 pool area is surrounded by luxurious day beds both in and around the pool which acts as the perfect place for socialites who like to spend their days partying with friends while bronzing under the Balearic sunshine. Prefer to relax and unwind away from the masses? Escape to your own haven by relaxing in one of our lavish hammocks or sun loungers set within secluded corners of our beautifully landscaped gardens. Open from 11am until midnight, the Sunset Terrace boasts an extensive selection of premium Champagnes, spirits, beers, wines and an exclusive own menu of creative and unique signature cocktails. It also offers another area within Ocean beach to sample some of the great dishes available from our poolside menu. The Ocean Beach massage area is the place to recover, invigorate or be primed for the partying, with an amazing massage menu. Both anti-stress massages as hot stone massages are offered. The Garden bar provides the perfect backdrop for lazy lunches or big occasions throughout the day so allow one of our attentive staff members to look after you whether you are looking for light bites at the comfort of your bed by the pool or reserve a table on our sunset roof garden sampling a taste sensation from one of our carefully selected dishes on the menu at our fusion cuisine restaurant.